We have already discussed the importance of the Keyword Planner for your SEO strategy to help you decide what content to develop, see what your potential clients are looking for and understand which keywords your website currently has an organic presence for. Another important use of the keyword planner is the organization of AdWords campaigns. The tool gives precious information that is essential for the set-up of online advertising in Google. In this article we will talk more in detail about different information the keyword planner makes available for the advertisers. This is probably the most used function of the keyword planner. Given a list of words related to your business, a landing page or a product category, the tool suggests more terms related to your search that have been used in Google. With these keywords you can create and structure your ad groups. When you divide the campaign by ad groups, don’t forget that every ad group has to contain terms that are related to each other. Don’t mix apples with oranges. Try be as specific and detailed as possible. The more ad groups you create the more specific and relevant your ads will be to searches. If your ads are more specific, you increase the opportunity to have potential sales. The Keyword Planner gives you ad group ideas as well, don’t ignore them by focusing only on single keywords. This is a great time-saving option, let Google do the job for you. Keyword planner results include important historical statistics and a traffic forecast for the set of proposed terms. If you already have in mind a particular budget, the tool will make your life easy by estimating a total number of clicks that you can get for those keywords. It also tells you about ideal bids for each term. In the section “competition” it shows how much a keyword is on demand and how many advertisers bid for it. IMPORTANT: if your bid for a keyword is too low, your ad won’t appear in the first page of Google, thus causing a decrease of quality score for the campaign. Accurately select bids for your keyword and make sure they are high enough to guarantee good exposure. Another important aspect of the keyword planner is finding unrelated keywords that are included in your suggested keywords list. You must use them as negative keywords to properly target the audience you are interested in. Example, if you are Apple and you want to use your brand name as a keyword for your campaign you must add “fruit”, “organic apples”, “red”, “green” as negative keywords. Doing that will avoid your ad being shown to people who are looking for groceries online. Another useful function is the keyword multiplier. This option helps you to automatically combine different keywords and make a list, thus avoiding manual efforts to write them. Let’s suppose that you’re a hospitality provider and you offer different services in different locations. So let’ say that you offer hotel, house and apartment accommodation in Hong Kong, Shanghai, Beijing, Singapore, Kuala Lumpur, Tokyo, Melbourne and Sydney. In order to properly show your services, you will have to advertise with 24 keywords (combination of your services in the different cities). If you had to write them manually it would take quite a while, this is the reason why the keyword multiplier offers you a great time saving incentive. 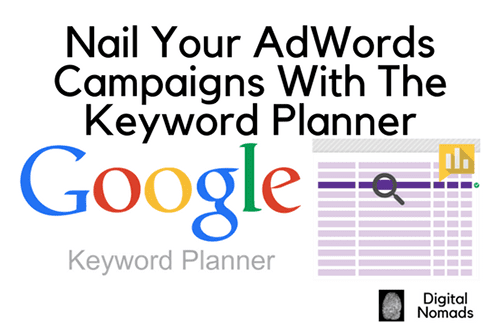 The Keyword Planner has to be to at the base of your AdWords campaign. When you use it to select your keywords, always keep your final scope in mind. Do you want to increase your brand awareness or do you want to generate more leads? Do you want to have an increase in web traffic or do you want to make more sales? Choosing the right keywords is crucial for your final success. If you think your keywords strategy is correct but you’re still not getting the results you wanted, then give us a buzz and we will show you how to overhaul your AdWords campaigns.